The initial concept for the game came from playing Street Fighter Alpha 3’s Dramatic Battle mode with friends (essentially two-player co-op against an A.I.. I remember how fun it was to do a combo and have the other player cover your gaps, or bail you out when you were under attack. I wanted to give players the opportunity to pull off stylish combos with minimal effort, but in a brawler setting with loads of enemies and sense of progression. A lot of inspiration was drawn from the Guilty Gear Fighting Game franchise, which is known for its fast combat, and brawlers like Alien vs Predator and Battle Circuit gave me insight into which mechanics work best in that genre. 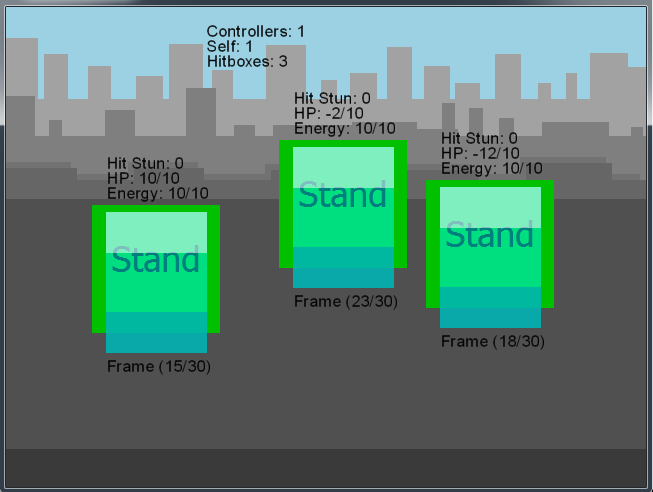 I proceeded to add a liberal dose of programmer graphics, and eventually it started to look a little more like a game. 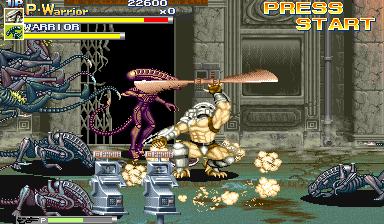 It had all the basic elements: combos, juggles and a Style Gauge (reminiscent of the one found in Devil May Cry), as well as plenty of hit stun. I posted the prototype on the local game dev forums for feedback and got a really good response. It was through my makegamessa.com posting that I started collaborating with Dawid Strauss, a fellow fighting game enthusiast and artist at Free Lives, who had previously worked on Broforce. We found we had a shared vision, and we proceeded to refine the core concepts and mechanics of the game together. 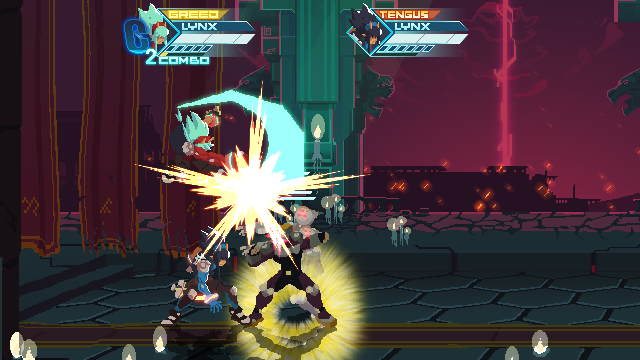 ShatteredRealms features a mix of brawler and fighting game mechanics. 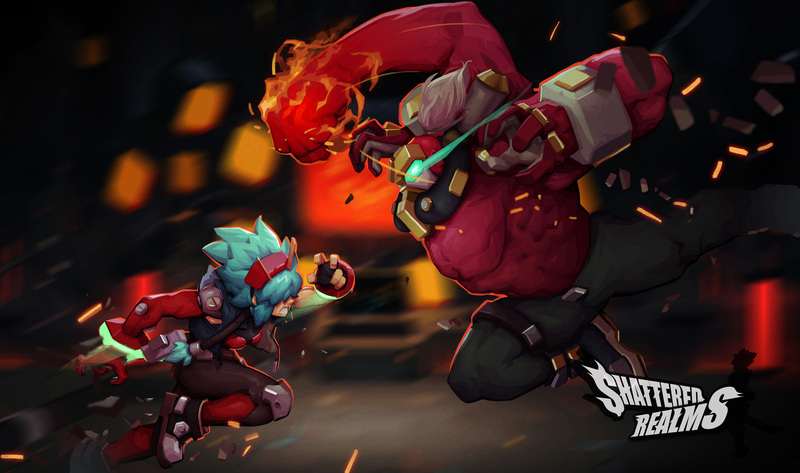 We wanted to create the feeling of power one gets from pulling off a big combo in a fighting game, but in a brawler setting, with more enemies and more opportunities for chaos. Choosing which mechanics to take from either genre was our biggest initial priority. Firstly, we wanted to completely remove the execution barrier by making moves as simple as possible. Special moves are done by holding up or down and pressing an attack button. The more complicated moves require you to double tap a direction and press a button. Blocking was one of the mechanics we chose not to take from fighting games, as blocking could often lead to enemies swarming you and keeping you in a constant block stun. Also, being defensive slowed down the pace of combat, which we wanted to avoid where possible. However, we needed to give players options to get out of trouble, which is where we took inspiration from Guilty Gear’s mechanics. Using hitstun deterioration, air and ground recovery, quick rise, burst and roman cancels, we were able to give players the tools to recover from a disadvantaged state. This meant we could balance upwards, as these tools prevented any strategy from becoming overpowered. We also thought long about whether to include parries in the game (and we’ll probably never stop wondering) but we found replacing it with dodge (or backdash) gave the same benefits when used offensively, and had a much lower execution barrier. And then there were the staples from both genres, like EX moves (powered up versions of regular moves) and super moves, which integrated naturally with what we were making. For the Pre-Alpha build, Dawid worked his fingers to the bone creating placeholder art during his spare time. Deon van Heerden, who did the music for Broforce, also got involved and produced some great music for the stages and boss fight. When we finally had something people could play, we launched the Pre-Alpha on itch.io to a very receptive audience. The response to the feel of the combat, as well as the challenging boss fight, was overwhelmingly positive. One of our local Fighting Game Community (FGC) members, Sigma, created a video showcasing some of the potential offered by the combo system. A few months after the pre-alpha's itch.io launch, we were approached by Free Lives, who saw potential in our prototype, and felt that it was something that needed to exist. They offered to incubate the development of a vertical slice to help produce high quality art and audio. This would then be used to help test whether there was a broader audience for our game. 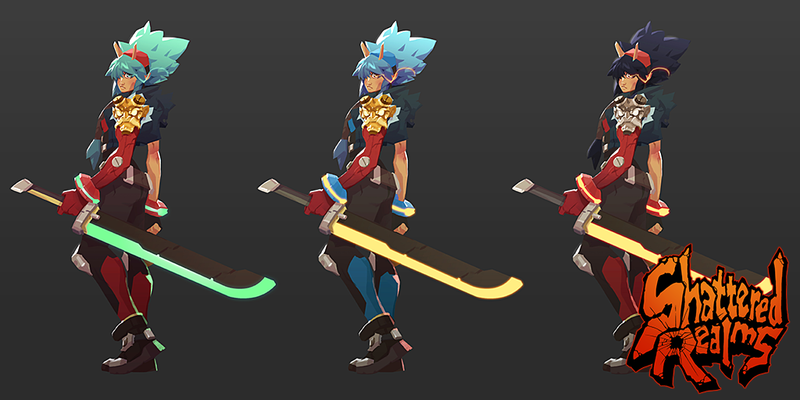 Thanks to their support we were able to hire a full-time art team. The first person to join the team was the incredibly talented artist, Malcolm Wope, who redesigned the world of Shattered Realms from the ground up, and gave us a redesign of Lynx that blew our minds. 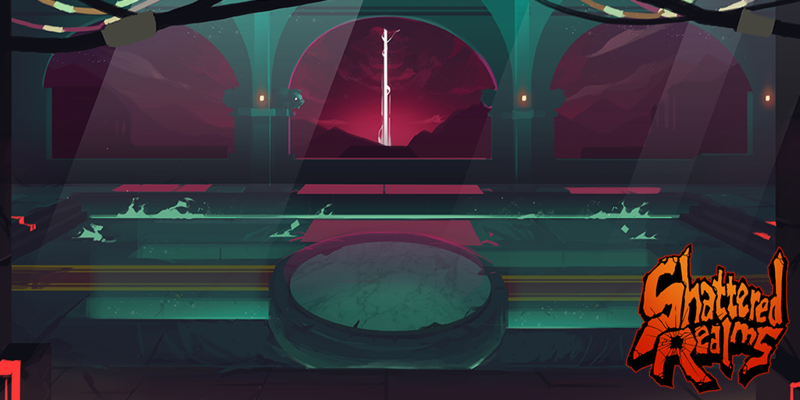 He also produced environmental designs for the game world, helping to establish the game’s aesthetic. Next we needed someone to convert concept art into pixels, and this is where Ben Geldenhuys and Dorian Dutrieux came in. Ben was in charge of creating the animations for all the player and enemy characters, while Dorian focused on creating the backgrounds, all under the watchful eye of Dawid, who served as our art director. Now we had a game that looked as good as it played. The audio was tackled by Deon van Heerden and his brother Ruan. So often in indie game development the audio is left ‘til the last minute, but we decided to get them on board right from the start so that they could help shape the world in our minds. Together they recorded, designed and sourced the game’s sound effects in tandem with the new art that was being produced, to create a cohesive sound pallette. 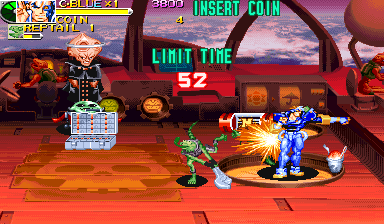 Music was handled by Deon, who has dubbed the level music’s genre “Power Synthwave,” drawing on both the electro-neon aesthetic of the game, and his power metal background. He also provided voice work for the game’s enemies, and recording facilities for Lynx’s voice actress, Jeanette Otto. Implementation, testing and advanced coffee making were primarily handled by Ruan. The combat system also got an overhaul during the incubation process. Initially we had a more traditional combo system where moves were only allowed to follow certain routes. For example, in Street Fighter the typical route is: normal attack → special attack → super attack. However, I wondered what it would be like if all restrictions were removed; in other words, how the game would feel if any attack could cancel into any other attack (as long it connected). The result was the Combo Sandbox system that allowed players to directly execute the move they were thinking of, rather having to follow a predetermined route to get there. The Combo Sandbox would become the signature aspect of Shattered Realms’ combat. We found that it made combat feel more intuitive, and negated the need for memorising long strings. In short, it achieves our aim of making deep fighting game mechanics more accessible. All that is needed for the player is a knowledge of what a move does, and in what situations it is useful. Then, when they see the opportunity, they can cancel into it immediately from their current attack. So, by learning new moves, a player’s combo potential grows organically as new combo opportunities open up. Our biggest desire was to create a boss that felt like you were playing against a human opponent, pushing you as hard as you were pushing him. Firstly, we gave him all the tools that the player had: air/ground recovery, dodge, burst - the works. Then we gave him a moveset that would allow him to attack from multiple ranges and cope with different situations, such as when the player is knocked down. He was also given the ability to do air combos which made him a well-rounded opponent. The A.I. was give three states of aggression depending on how much health he had left, meaning he’d start pushing back harder, and use more of his moves the more desperate he became. But I also wanted to give skilled players something to test themselves against, so the A.I. watches your Damage Per Second (DPS) output against the boss; if it goes over a certain threshold, he starts becoming more aggressive regardless of how much health he has left. More cautious players using hit-and-run tactics get a lower aggression/health ratio than more skilled players going all-in (which is the only way to achieve a high rank against him). 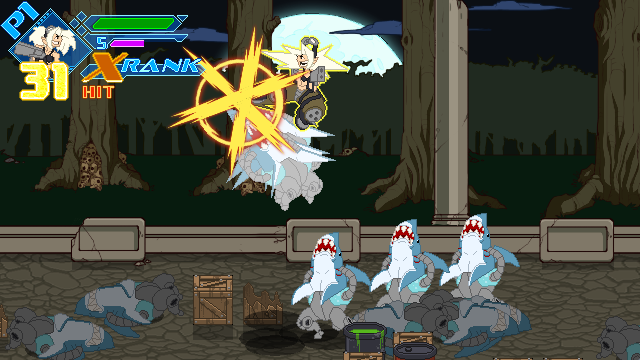 The result is difficulty that scales dynamically based on the player’s skill; they are the input to the game’s difficulty equation. It has been a long road, but the last 6 months have been by far the most exciting. Thanks to Free Lives’ support and guidance, we have been able to build a vertical slice of the game of our dreams. It’s a game we believe should exists, because nothing else like it does. Currently, theShattered Realms demo is available for free on itch.io, and I can’t express how proud I am of my team, and the demo we’ve put together. The future of the game at this stage is entirely in the hands of the fans and players. 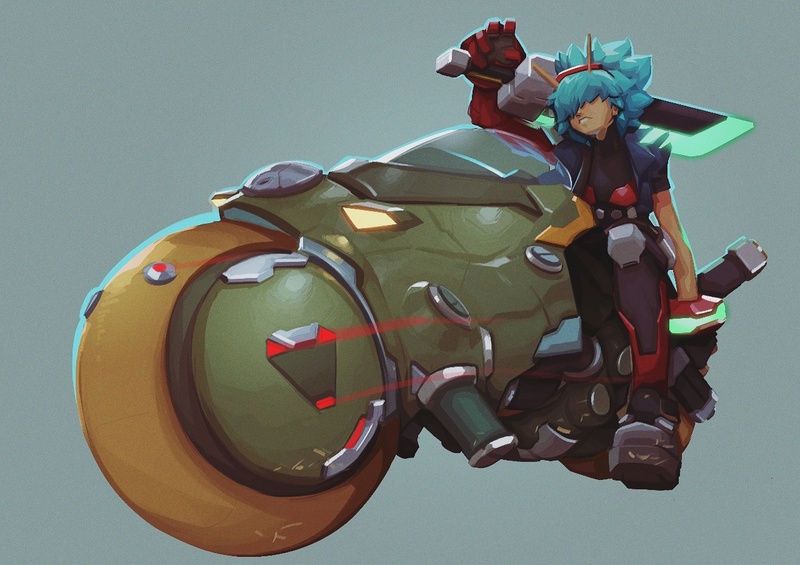 One of the outcomes we wanted was to see if there is a big enough market for a brawler like this. If enough people want Shattered Realms to exist, it will. We’re gathering feedback and watching people play to help improve the game. If you’ve played the demo, please let us know what you thought; we’d love to hear from you.